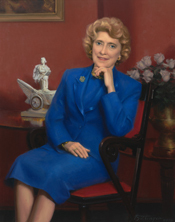 Corinne Claiborne (Lindy) Boggs" in Women in Congress, 1917-2006. Prepared under the direction of the Committee on House Administration by the Office of History & Preservation, U. S. House of Representatives. Washington: Government Printing Office, 2006. Ferrell, Thomas H., and Judith Haydel. Hale and Lindy Boggs: Louisianas National Democrats." Louisiana History 35 (Fall 1994): 389-402.